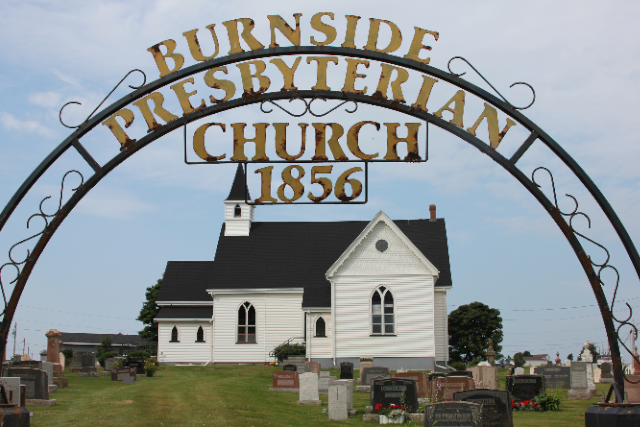 Memorial Service – Burnside Presbyterian Church, Sunday, July 29th, 7:00 p.m.
Burnside Presbyterian Church in Clyde River is pleased to invite you to their annual cemetery service on Sunday, July 29th, 7:00 p.m.
Burnside is caretaker of the cemetery that has been in use since 1861, with a new section added in 1962. As the cemetery grows, so does the list of families who are connected to the cemetery. The cemetery committee has endeavoured to find the names of descendants who have a loved one(s) buried there. Their wish is to include all those people who have a connection to this cemetery to attend their July 29th service. Having their service at 7:00 p.m. in July allows us to still have sunlight that will make it possible for visitors to visit the grave of their loved one. We are planning an uplifting service of remembrance with special music and a time for refreshments and visiting. There will also be musical accompaniment as visitors enter and leave the church. The service will finish at 8:00 p.m. and visitors are then welcome to the Riverview Community Centre across the road for refreshments. They welcome you to attend with friends and relatives to remember your loved ones that have gone from your everyday life, but who clearly live on in your memories. While death may be sad, remembrance is not. We talk openly of life. Of joyful times we had. And the joyful times we will have together. Death gives no joy. It has no voice. We have muted it because there are no more time to have together. those we loved, is joyous. and in the very essence of our being that shall remain forever. Death is sad. Remembrance is not. So, let us remember their lives. Forever.